The Arctic Monkeys have won three Brit Awards in two years - but continue to shy away from the spotlight. The four-piece from Sheffield claimed their place in the record books in January 2006 when their album became the fastest-selling debut in UK chart history. Whatever People Say I Am, That's What I'm Not sold 360,000 copies - including 100,000 sales on its first day of release. The press claimed the band's sudden rise was down to the power of the internet, while others speculated that their good fortune was down to a skilful public relations campaign. The Monkeys denied being responsible for putting their music online and said they were unaware of the storm they were whipping up in cyberspace. However they managed it, the buzz gave them their debut UK number one single in October 2005 with I Bet You Look Good On The Dancefloor. Popular acclaim was swiftly followed by industry recognition and a number of awards. Their first Brit award came for best breakthrough act in 2006, beating the Kaiser Chiefs and chart-busting singer James Blunt. But the band have never been comfortable with their rapid rise to fame, giving few interviews and trying to keep out of the limelight. 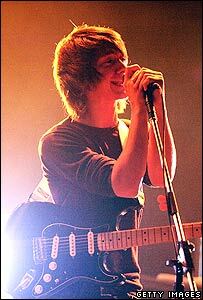 "I do worry it's been too much too fast," singer Alex Turner said. "It's almost vicious, people grabbing at us. "But we don't take ourselves too seriously. If we did, everything would fall apart." The strain did become too much for bass player Andy Nicholson, who quit the band after declining to take part in their US tour, to be replaced by Nick O'Malley. His absence from the band in May was attributed to "fatigue following an extensive period of touring". When the band won the Mercury Music Prize for album of the year last September, they gave a famously curt press conference, frustrated at the cliched questions they were being asked. Drummer Matt Helders joked their media shyness had been a "social experiment" to see if the band could excel without giving interviews. Their response has been that they "haven't had to" give interviews during their whirlwind career, with the music speaking for itself. They have been warmly received in the US - but the reception has not been as frenzied as it was in the UK. They received a Grammy nomination for best alternative album - but the Hollywood Reporter said one of their first concerts was "not the messianic exercise it was impossibly built up to be". But their popularity does not seem to be fading in the UK, where they have now won Brits for best British group and best British album. 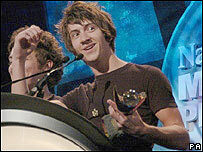 The awards come as they prepare to release their follow-up, titled Favourite Worst Nightmare, in April. The band have been quoted as saying their second album is "a bit different" and "a step on". And as they also prepare to headline the Glastonbury festival, the group must try to keep the bandwagon under control and ensure their promise is fulfilled.